We cover a lot of expensive pieces of technology here at Techlicious, from $85,000 televisions to $1,495 HDMI cables. Sometimes, though, the coolest pieces of tech are also incredibly inexpensive. That’s the case with this $11 bumper-mounted laser designed to help prevent rear-end collisions in fog and other limited visibility weather conditions. 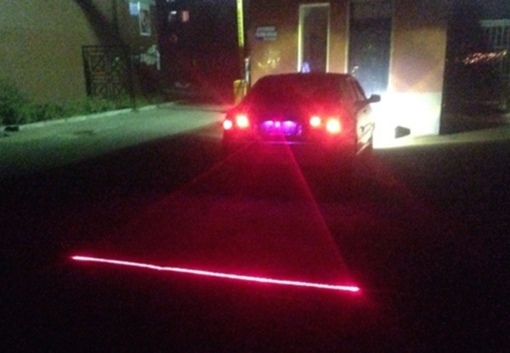 The laser works by projecting a bright red line on the road behind your vehicle. Even if fog makes it difficult to see your car’s taillights, others will be able to see the moving laser line and be alerted to your presence. The car safety device itself is low-powered enough that it won’t blind other drivers. The laser wires to your car’s electrical system so it only operates when you’re driving. It mounts to your car using screws or a simple 3M adhesive pad (included), letting you decide exactly how far behind your vehicle you want the red line to appear. Generally, you’ll want it set between 15 and 20 feet, though you can push it back even further if the weather is especially bad. The bumper-mounted laser is currently available for sale on banggood.com for $11. Before you buy it, though, you’ll want to check with your local and state law to verify that the device is legal to use where you live. Similar technology is also available for cyclists – be sure to check out this battery-operated laser taillight for bikes on Amazon.com for just $6.90.